I Forgot My iPhone Screen Lock Passcode, How to Reset? Posted by Vicky Tiffany on Mar.02, 2017 17:54 PM. iPhone has so many features at its disposal that it is more secure than any other phone available in the market. One of them is the screen lock attribute that requires authentication on the part of the users. Therefore, nobody apart from, you can use your phone, however, what if you forget screen lock password? The call has to be made but somehow the magic words don't strike the grey matter. In such a case all is not lost because our dear Apple has thought about the contingencies that might arise and prepared for the same. So, let see what tips we can follow to break into the phone. 1) To start with, connect the iPhone to the MAC or apple PC for synchronization. Once connected, open the iTunes. Inc case, the device is asking the pass code, switch to another computer that is already in sync with the gadget. The trick is to login to the interface without the password. 2) In the second step, if the device doesn't work with the phone, click the sync button on the device with iTunes. It is the sure shot way to accomplish the task accurately. 3) After the completion of the backup and the sync process, all that is left is to click on the Restore iPhone link. 4) Once clicked, the IOS set up assistant pops up and prompts the user to invoke "Restore from iTunes backup". 5) In the last and the final step, you need to choose the device located in the iTunes and select the recently stored backup. In short, following the above-mentioned tips, you can easily by pass the pass code and access the apple phone. NOTE: You can reset the passcode when not synchronized with iTunes. 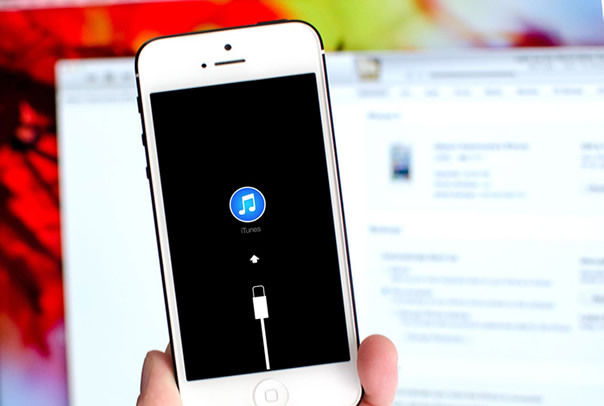 You can try connecting the iPhone to the computer but if the message says that the iTunes require a pass code or without the passcode, the device would not trust the computer, it is time to use another method for backup. This method will erase everything and settings on your device and should be used cautiously. If you forgot iTunes backup password, maybe this article would be helpful to find your backup password without erasing data. 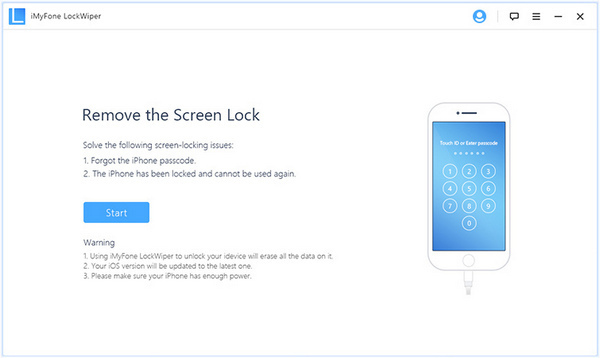 Another easy way is try iOS Locker to unlock your screen lock on your iPhone, and iPad. It only takes 5 - 10 minutes to finish the entire unlocking process without leaking your private information. It's extremity easy to use and completely erase everything on your device without recovery. It just needs a few clicks and no technical skills required. Please download the program and run it on your Mac computer. Launch the program and select "Unlock" feature among all the features. Then you need to connect your iPhone/iPad to the Mac computer using a lightening cable and click "Start" on the program. Then you need to put your device into DUF mode. After you put your device into DFU mode, the program will shows all device info including iOS version, phone generation, etc. Choose the correct information based on your device in the dropdown lists. 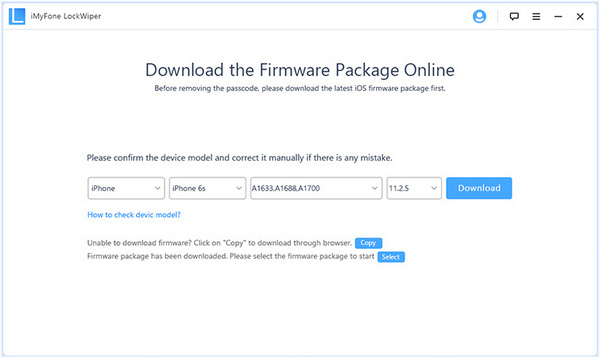 Then click Download the download the firmware for your device. When the firmware is downloaded successfully, just click Unlock button to begin unlocking your iPhone and iPad screen passcode. 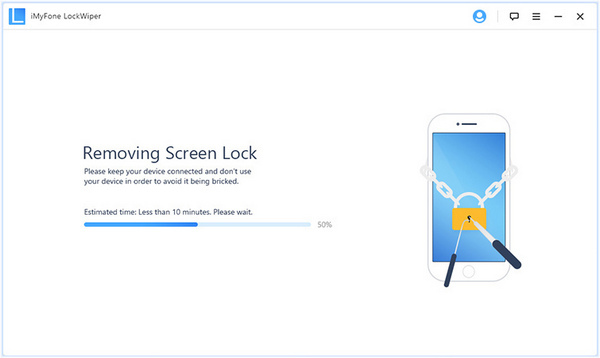 Just in a few seconds, your iPhone will be unlocked successfully. Note this method also wipe your data on device, but it's easy and fast! To be honest, there is no way to bypass iPhone/iPad screen lock without wiping data. In case the FindMyphone option is active, make sure to use the Remove Wipe feature and eliminate the previous settings of the device or else it might again demand the entry of the pass code. 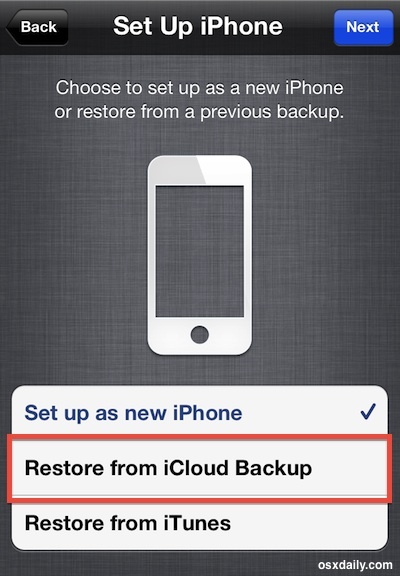 After completing the task, use iCloud to find the most recent backup and restore it to log into the device. It is one of the best ways to reset the passcode and gain access to your iPhone. In order to use the FindMyphone and iCloud application, the smartphone should either have a Wi-Fi connection or mobile based internet. Without connection, the restoration of data is simply not possible. 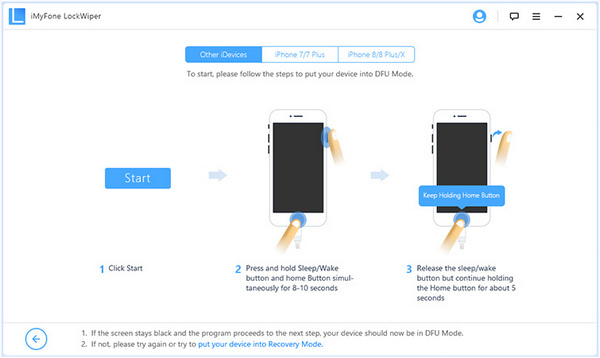 1) In the first step, the iPhone should be placed in recovery mode. To accomplish the task, detach the device from the computer or the Laptop that is used for synchronization. 2) Thereafter, switch off the phone by pressing and holding the power button till a slider appears on the screen. It should be slid down to power off the device. In case, the slider is not visible, keep on holding the lower edge of the power and home button to switch it off. 3) If the battery is not charged, plug the iPhone into the power adapter. After charging, you can keep on holding the home button down and plug in the USB cable from the computer or laptop. 4) The device will switch on, however, keep pressing home until iTunes and USB cable images are visible. Access the iTunes and you will see the message that iPhone is in recovery mode. 5) In the next step, you should click on ok on the dialog box from iTunes. The recovery mode is activated and thereafter you should click on the restore button to recover the most recent settings from the iTunes. If the smartphone is not in recovery mode you cannot retrieve the previous backups. In addition, the users should also check whether the photos, images and other contents are not removed from the system. The whole process is quite easy and even understood by laymen. So, next time when you forget the passcode, do not lose sleep by use the above-mentioned tricks and we are sure you will have access to the content. Also there are many other ways to reset iOS screen lock password, I'm sure that there is always a valid solution.